Adding lead tape to a club head can change its swing weight. When most golfers talk about adding weight to a golf club, what they are really talking about is the swing weight of the club: adding weight to the head of the club in order to increase the speed of the swing and thereby increase the distance that the ball is hit. There are different ways of doing this. 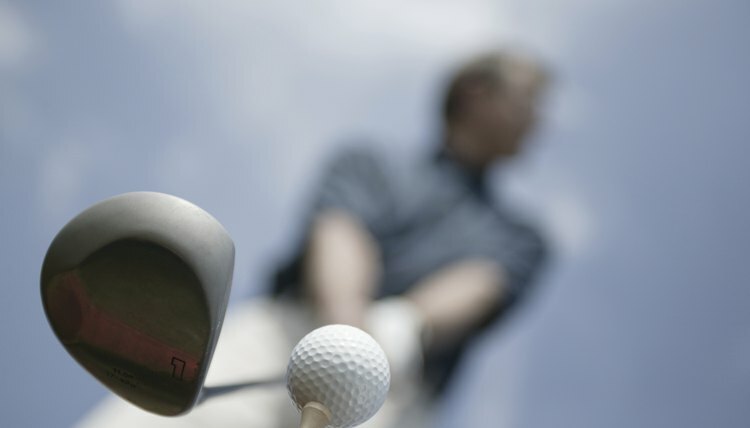 It is possible to change the club's shaft for one that is weighted slightly more toward the club's head. It's possible to buy a larger club head or to buy a head with a different type of internal fill material that increases weight. However, for the vast majority of golfers who want to increase the swing weight of their clubs, a special lead tape, which can be purchased at any pro shop and even many hardware stores, is the answer. Cut a 3-inch piece from a thin strip of lead tape. The tape will have a strip of paper on one side; removing the paper will expose a sticky side of the tape which will stick to your club's head. Decide what it is you want the extra weight to accomplish: Do you want to hit higher or do you want to reduce a draw or perhaps enhance a draw? What you want to accomplish determines where on the club head you add the weight. Adhere the tape to the base of the back of the club to hit the ball higher. Center the tape as much as possible between the toe and heel of the club. Test the club. More weight can be added if desired by adding a 1-, 2- or 3-inch strip of lead tape. Add weight to the heel area of the club to enhance a draw or to reduce fading. Again, test your club after adding weight to determine if enough weight has been added or if too much has been added. If you wish to remove the lead tape, use the point of your X-Acto knife to lift a corner of the tape and then peel it off. Rubbing alcohol can help remove any tape residue on your club. Add weight toward the toe of the club to reduce draw spin. Once again, test your club to determine if the tape has been added to the proper spot and if too much or too little weight has been added. Adjust as necessary.